Horse riding is a fun and exciting activity that can be enjoyed by people of all ages, although the initial meet and greet with such a large and muscular animal can be daunting for some. 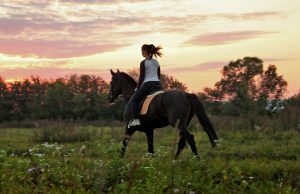 Check out the following guidelines for beginners seeking a suitable place to start their equestrian journey. Choosing a riding school – Arrange an appointment to visit your local centre and check for a clean and safe environment with properly enclosed paddocks, plus a friendly atmosphere with patient and knowledgeable trainers. Don’t be afraid to ask questions and request to observe a lesson to make sure the school is an appropriate fit for you. A variety of horses and ponies should also be available to cater for all levels of riding expertise. The first lesson – Novices will generally be paired with animals that are of sound temperament and easy to handle. The more horses you ride, the more you will appreciate their distinct personalities and find the perfect fit for you. Your initial introduction to riding will focus on how to sit properly, and get to grips with the movement of your horse. The experience should be stress free and enjoyable, and allow you to feel confident and comfortable at all times. The basics – Try to maintain an alignment between your ears, shoulders, hips and heels, which will encourage you to sit up straight and in a secure position. Point your toes towards the sky and keep your heels down to ensure increased security and absorb shock from the ride. How to hold the reins will alter depending on your riding school, although it’s important to keep your hands as steady as possible. Relax and have fun – Whilst riding can be an exhilarating experience, it’s essential to stay relaxed and in control of the situation. Listen to your trainer’s advice, and let them know instantly if you feel unsure or panicked. The session may not end in you blazing off into the sunset, but it should give you an idea of the wonderful possibilities and benefits that riding can offer.